Our expert local team has a wealth of knowledge and the expertise needed to give you the best possible gate opener services around, from installation to repairs. Read on to learn more about how our team can help, and feel free to contact us at any time. If your automatic gate opener has failed to function, there is no need for despair. Our skilled specialists will give you the peace of mind of knowing that your gate will, once again, open and close safely, effectively, and reliable. What’s more, in the event of you needing a replacement, you can rest assured, safe in the knowledge that we work with the industry’s leading opener brands. These market leaders include BSL, DKS, Ramset, and Eagle. All you have to do is take your pick, and our experts will take care of the rest. The motor is not always the root cause of your opener malfunctioning. These components are complex, and problems can range from a burnt electrical wire to a sensor malfunction. Thankfully, our local team of professionals is on hand to deal with all your opener-related issues, quickly and efficiently. We will get your unit operating effectively again in no time at all. 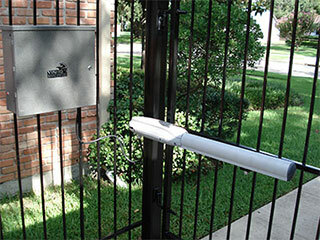 Opening your automatic gate system using a keypad device is hassle-free. All you need to do is key-in your password and Open Sesame! Not only is this convenient but also it is a valuable security feature too, as no-one will be able to operate your gate without the necessary password. What’s more, you can change the password as often, and as many times, as you like. Make an appointment to increase your gate security today! Even better than a keypad is the using your phone – yes! Your phone! This, however, requires replacing the opener to a supporting model. When you contact our local team at Gate Repair Encinitas you can rest assured that you are dealing with the most professional and experienced technicians around. Regardless of your problem, we can provide the most effective solution. So don’t waste valuable time – contact us to make an appointment today!